Jarkko Ruutu had a career-high three points as the Penguins celebrated Sidney Crosby’s return with a 3-1 win over the New York Islanders that moved them into sole possession of first place in the Eastern Conference. The Pittsburgh Penguins have become so accustomed to winning without Sidney Crosby that their role players continued to shine Thursday night even with their captain back on the ice. Jarkko Ruutu had a career-high three points and Georges Laraque chipped in with a goal and an assist as the Penguins celebrated Crosby’s return with a 3-1 win over the New York Islanders that moved them into sole possession of first place in the Eastern Conference. Ruutu snapped a 1-1 second-period tie with a shorthanded goal to back a strong effort by Marc-Andre Fleury, who stopped 27 shots. Pittsburgh moved past Montreal into the East lead with 97 points while opening up a six-point lead on New Jersey in the Atlantic Division after the Devils fell 3-2 to the New York Rangers. That’s not to say the Penguins’ big guns were completely silenced. Evgeni Malkin opened the scoring with his team-leading 45th goal of the season. When Crosby went down with a high ankle sprain on Jan. 18, Malkin was 14th in the NHL in scoring; he’s now second, four points behind Alex Ovechkin of Washington. Crosby, who missed 28 of the past 31 games due to the high ankle sprain, took three shots and went scoreless in his first game back after seven on the shelf. He took 20 shifts, for 20:25 of ice time, and played for the first time with Marian Hossa, acquired from Atlanta at the trade deadline. Hossa, who had missed the previous three games Crosby was in the lineup due to an injury of his own, ended up leaving the game early in the third and not returning after colliding with the Islanders’ Sean Bergenheim. The Penguins said Hossa suffered an upper-body injury. Still, it was hard to dampen the positive atmosphere that pervaded Mellon Arena for most of the night. Malkin’s wrist shot from the right circle found its way through traffic and beat Wade Dubielewicz at 6:53 of the first period. Josef Vasicek got the Islanders even 3:29 before the intermission, but Fleury was flawless after that. Ruutu kept up his red-hot play when he intercepted a Richard Park pass intended for Miroslav Satan during a New York power play. Ruutu collected the puck at his own blue line, skated down the left side, went around the net and scored his sixth of the season on a wraparound between Dubielewicz’s legs. Laraque added his fourth of the season and 52nd in 630 NHL games by catching Dubielewicz by surprise 6:40 into the third. "I got lucky because I lost the puck, so I just chipped it in," Laraque said. "I didn't even mean to do that and it went in, so I guess it's a good thing I lost it because I would have made a move and he probably would have stopped it." Said Dubielewicz: "The puck bounces over his blade and runs flat, so he panics and just puts it on net, but because he tried to pull it, I made a move and he caught me in my move." Tomas Fleischmann had gone 14 games without a goal and hadn’t even recorded a point since the calendar switched to March. All that was forgotten thanks to one huge play in overtime that helped the Capitals remain in the thick of the Eastern Conference playoff race. Fleischmann scored 2:27 into the extra period to cap a comeback win over Tampa Bay at St. Pete Times Forum. Alexander Semin forced overtime with 4:48 left in regulation when he ripped a shot past Lightning goaltender Karri Ramo after a faceoff win by Sergei Fedorov. ''We still believe we can make the playoffs,'' said Fleischmann, who fired Brooks Laich’s pass into a wide-open net after Ramo made a dive for a loose puck at the side of the net and couldn’t corral it. With four games left in the regular season, the Capitals are two points behind Carolina in the Southeast Division. The Hurricanes play five more games. The Capitals are also two points out of eighth in the Eastern Conference. After watching a pair of one-goal leads slip away, the Capitals fell behind 3-2 when Michel Ouellet scored for the Lightning at 6:51 of the third. But the Bolts couldn’t hold the lead either, dropping to 7-35-4 when tied or behind after two periods. "I'm not going to talk about the third period," said Lightning coach John Tortorella, who walked out of his postgame news conference after two questions. Laich gave the Capitals a 1-0 lead on a shorthanded goal with 2:02 left in the first, but Jeff Halpern answered 42 seconds later with the Lightning still on the man advantage. In the second, Matt Bradley scored from the left circle at 3:11 to put Washington back in front, but Tampa got even again at the six-minute mark on a goal by defenseman Alexandre Picard. Cristobal Huet made 23 saves as the Capitals won for the sixth time in seven games and improved to 4-1 on a six-game road trip that concludes Saturday against Florida. "We're in a dogfight here," said Laich, whose 20 goals are a career high. "We're desperate, we're hungry. It's a great time to play right now." Buffalo’s competition for the eighth and final Eastern Conference playoff berth had already won, leaving the Sabres no other choice but to find a way to do the same. Derek Roy helped them shake off one of the League’s worst shootout records to pick up the extra point, as the Sabres left Scotiabank Place still hanging on to the hopes their season might extend beyond April 6. Roy scored the winner in the third round of the shootout and Buffalo kept pace with Boston and Washington, which also won. The Sabres remained three points behind the Capitals for ninth and five points in back of the Bruins and Flyers, who are tied for seventh and eighth. Buffalo has five games remaining. "I thought we deserved to win it from start to finish," Sabres coach Lindy Ruff said. "We didn't give up a lot, we did a pretty good job against their top line, and I think when you work that hard and put the work in — we got rewarded." Defenseman Paul Gaustad got the Sabres one point when he tied the score with 1:26 to play in regulation before Derek Pominville and Roy scored in the shootout to secure the second point. Ryan Miller stopped 25 shots through overtime and two of three Ottawa shooters in the tiebreaker. "It was great to get that goal," Miller said of Gaustad’s equalizer. "It was about the time I was getting a little antsy, like, 'OK, we better do something.' It's a good feeling and it keeps us alive." 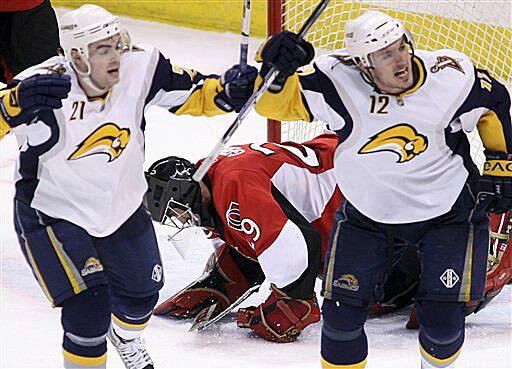 The Sabres had been just 2-9 this season in shootouts, but Pominville put them ahead in the second round. Jason Spezza started the third round by beating Miller to tie it, but Roy managed to put enough on his attempt to get it past Martin Gerber for the deciding score. "I wanted to make a stutter and stop for a little bit and strip his gap a little and I just tried to make a move to my forehand and it happened to go in off his skate," Roy said. Maxim Afinogenov and Jochen Hecht scored first-period goals that turned a 1-0 deficit into a 2-1 lead for the Sabres. Spezza got the scoring started in the first period and Mike Fisher had a pair of goals for the Senators, who moved into fourth in the East with the point. Gerber made 37 saves during regulation and overtime. "It's disappointing to lose like that," Fisher said. "With a minute and a half left, you know we've got to bear down and be a little bit better but that's a team that's fighting for their lives and playing pretty hard. We know we've got to overall be a little bit smarter and better in the defensive zone." Boston strengthened its bid to make the postseason while officially eliminating Toronto from playoff contention. Four Bruins scored and Tim Thomas turned aside 30 shots, lifting the Bruins into a tie for seventh with idle Philadelphia in the East. The two teams are four points ahead of ninth-place Washington. "We have a lot of guys stepping up and that's what good teams do," said forward Glen Murray, whose power-play goal midway through the third held up as the game-winner. "I didn't think Toronto was going to go away and let us have it, but we need the wins more than them." Marco Sturm, Phil Kessel and Peter Schaefer also scored for the Bruins. Jiri Tlusty and Pavel Kubina responded for the Leafs, who will miss the playoffs for a third straight season — something that hadn’t happened in 80 years. Antropov and captain Mats Sundin both returned to Toronto’s lineup after missing several games with injuries. They combined to set up Tlusty’s goal 4:47 into the second that tied the score after Sturm’s goal with 3:13 left in the opening period had put Boston in front. Kessel put Boston ahead to stay 5:47 into the third when he got behind the Toronto defense, took a pass from Schaefer and deked before putting the puck past goalie Vesa Toskala. Murray extended the lead to 3-1 with 9:06 remaining. Kubina provided the Leafs’ last gasp by connecting on the power play with 4:59 left, but Schaefer responded just 23 seconds later with a backbreaker, taking a shot that deflected off Toronto’s Jason Blake and behind Toskala. The Leafs had won six straight on the road before Thursday, but that statistic, like many others now, was all for naught. Even the Bruins had some sympathy for what their longtime rivals have had to endure in recent years. "Toronto is the hockey mecca," Boston forward Glen Metropolit said. "The Maple Leaf symbol is known around the world and it is unfortunate what has happened." Atlanta snapped a five-game losing streak and may have ended Florida’s chances of returning to the playoffs for the first time in eight years. 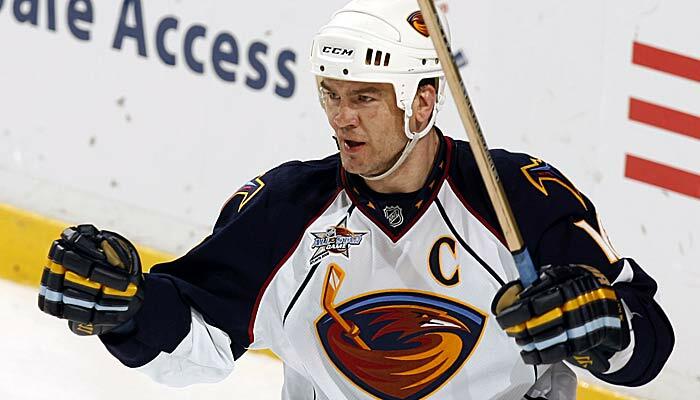 Bobby Holik scored a pair of goals and Mark Recchi had the go-ahead score with 6:13 remaining as the Thrashers dealt the Panthers their second straight defeat following an 8-0-1 stretch that lifted them back into postseason contention. Holik’s second of the night and 14th of the season was scored into an empty net with 59 seconds left and gave Atlanta a 3-1 lead. It wound up as the game-winner when Radek Dvorak tallied for Florida with 1.9 seconds to play. The Panthers, 11th in the Eastern Conference, remained stuck at 81 points, seven out of a playoff spot with only four games left. "You look at where we are, this basically took us out of (any) chance," said Tomas Vokoun, who made 26 saves. "It's tough, no question about that. Against a team like that, playing at home, to lose a game in the position that we were, it's tough." Recchi, whose last goal came Feb. 23 against Toronto, took advantage after teammate Bryan Little poked the puck away from defenseman Karlis Skrastins deep in the Florida zone. Recchi one-timed Little’s centering pass from behind the net past Vokoun for his first goal since Feb. 23. "You go through stretches like that unfortunately," the 40-year-old said. "I used to be a little bit more consistent, but I'm not quite the sniper I used to be. I still feel good out there and can still make plays." Florida fell behind in the closing seconds of the first period when Ilya Kovalchuk’s slap shot was stopped by Vokoun but Holik knocked in the rebound. The goal came with just 7.2 seconds left in the first and gave the Thrashers a 1-0 lead. Nathan Horton got the Panthers even midway through the second on a breakaway. Horton deked and beat Keri Lehtonen with a backhander at 9:46 for his 26th of the season. Lehtonen was stellar in stopping 43 shots as the Thrashers snapped a 10-game road losing streak. Long out of the playoff hunt, they took some pride in playing spoiler against the Panthers. 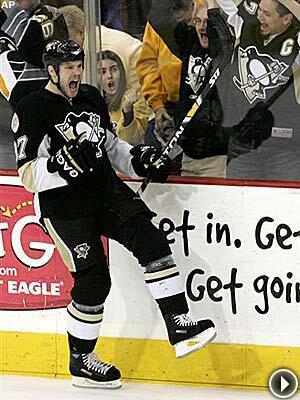 "If you're out of it, at least you go out there and play with pride," Recchi said. "They had to run the board, we knew that. It's a good feeling. I only know a couple guys over there. I feel bad for them, but not for the team." Joe Thornton scored on a two-man advantage with 2:02 left in overtime and San Jose clinched home ice for at least the first round of the playoffs while beating a team that has made its life miserable at the Shark Tank. Dallas lost for the eighth time in nine games overall and had its six-game winning streak in San Jose snapped. Thornton’s goal, his second of the night, capped a brief, but highly eventful extra period that featured a double high-sticking minor to Dallas goalie Marty Turco, a near shorthanded winner by Mike Modano that went to video review and a hooking penalty to Stars defenseman Trevor Daley. It took Thornton just 12 seconds of the ensuing 5-on-3 to take advantage, as he banked a shot off the Dallas defense and past Turco. Patrick Marleau, also positioned in front, reacted as though he might have deflected it in, but the goal was later awarded to Thornton, giving him 26 for the season. Modano thought he had won the game moments earlier when he broke in alone on Sharks goalie Evgeni Nabokov. Modano’s original shot went wide but he grabbed the rebound and tried to jam the puck inside the left post. A diving Nabokov blocked the puck from going in, but it sat on the goal line for several seconds before his defense was able to clear it away. 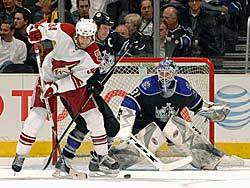 A video review showed that despite several jabs at the puck by Modano, it never completely crossed the line. Brenden Morrow and Jere Lehtinen scored for the Stars, and Turco finished with 24 saves, but his previous success against the Sharks in their building was overshadowed by his costly penalty when he got his stick up on Joe Pavelski. Dallas let a pair of one-goal leads slip away. After Morrow opened the scoring with 4:01 left in the first period, Pavelski tied it 3:48 into the second with San Jose on the power play. Lehtinen made it 2-1 at 12:29 by connecting on a two-man advantage. Turco and the Stars protected the lead into the third until Thornton forced overtime by scoring at 6:08 after taking a no-look backhand pass from Mike Grier. San Jose now prepares for a big game Friday in Anaheim. The Sharks lead the Ducks by six points in the Pacific Division and can clinch the third division title in franchise history and No. 2 seed in the Western Conference playoffs by gaining just three points in their remaining five games. Erik Ersberg continues to provide a beacon of light in what has been a difficult season for Los Angeles. The Swedish rookie made 38 saves for his fifth NHL victory and second shutout, and Anze Kopitar had a goal and two assists as the Kings scored three times in a 6:11 span of the second period. Since being recalled from Manchester of the AHL, Ersberg has allowed two goals or less in seven of his 10 starts. He earned his first NHL win on March 6 by stopping 40 shots in a 2-0 win over Ottawa. Kopitar set up Kevin Dallman with a cross-zone pass and Dallman beat Mikael Tellqvist at 6:52 of the second to snap a scoreless tie. Kopitar followed 3:22 later with his 30th of the season, backhanding home the rebound of Brian Willsie’s shot. At 13:03, Dustin Brown struck on the power play for his 32nd goal and a 3-0 lead. Los Angeles captain Rob Blake capped the scoring with 8:06 left in the third. 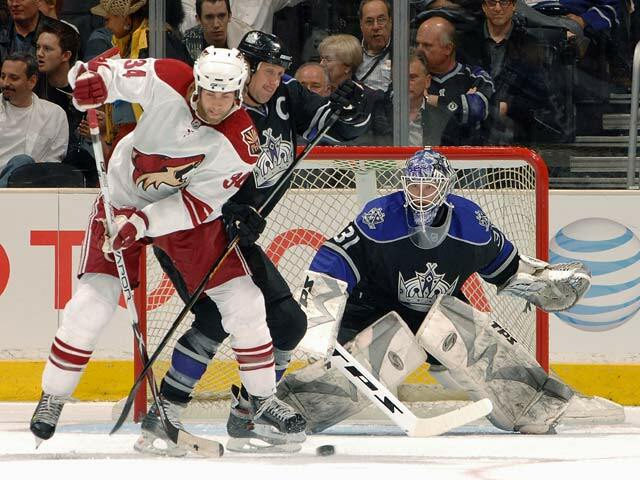 The Coyotes peppered Ersberg with 18 shots over the final 20 minutes, but were repeatedly denied.